Statistics show that 9 out of 10 adults have experienced serious stress. Stress is a part of everyday life but has become more of a problem since the introduction of technology into our already fast paced lives. Time constraints, feelings of inadequacy and unrealistic expectations can all lead to feeling stressed out. A certain amount of stress can be useful as a motivating factor but too much stress can be harmful to your body. First, when the body is under a lot of stress it lowers your serotonin levels, which puts you in a poor mood or even a feeling of depression. Often the result is reaching for food as a “comfort.” This often leads to weight gain because the food choices are usually poor and/or an over consumption. Second, stress has been shown to boost your blood sugar and insulin levels, which suppresses your fat burning capabilities. Third, Stress increases your cortisol levels, which can, at high enough levels, cause the body to deposit more fat around the mid-section. Stress can come from physical situations or can be emotional. Both kinds of stress have negative effects on the body because it causes the metabolism to fluctuate, blood pressure to rise and even depletes nutrients essential to good health. Of course, stress can also cause neck and backaches, dizziness, diarrhea, mood swings, fatigue, insomnia, lack of concentration, sexual problems, irritability and loss of appetite or over eating. 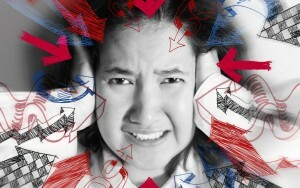 Ongoing stress can lead to mild anxiety, depression, heart complications, stomach conditions and migraines. People have a tendency to relieve stress with passive activities like eating, drinking or watching TV. Finding healthier ways to relieve stress is important. One of the most fundamental and beneficial ways to reduce stress is through regular exercise. Exercise helps to remove stress-causing adrenaline from the body while releasing endorphins that elevate mood and decrease levels of the stress hormone cortisol. Exercise can also contribute to a better night sleep.